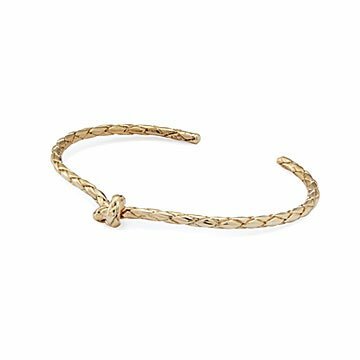 Inspired by the bonds of love, this bracelet is cast from braided rope tied in a charming knot. Inspired by the bonds of love, this bracelet is cast from braided rope tied in a charming knot. Amy Shepsman creates the piece from the hand-braided, knotted rope using the lost-wax method in which a precise mold is made using jewelers wax to reproduce the original's subtle detail. She then casts the brilliant bangle in shining polished brass. Great for layering with other bracelets and multiple Love Knot pieces, it offers an upscale look for your own collection, or a heartfelt gift for the one you love. Handmade in New York. She loves it and it fits perfectly. Could not be happier with the shipping/arrival time. She absolutely loves it. only takes it off to shower and sleep.